Discover the testing tools included in Visual Studio Team Edition and start whipping your application into shape today. The content in our guide is arranged by task and test type to help you quickly understand how to create, manage and run your own tests. Take a moment to e-mail us to let us know what other guides you'd like to see on SearchVB.com. 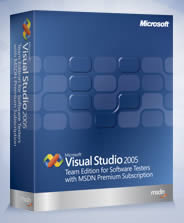 Microsoft: "Visual Studio Team Edition for Testers includes a suite of test tools that are integrated closely with Microsoft Visual Studio 2005; they work not only in their own testing framework, but also within a larger framework of software life cycle tools." Brent Sheets is a former Senior Editor at TechTarget and a frequent contributor to SearchVB.com. He founded and managed the popular Visual Basic Web Directory website until it was acquired by TechTarget in 2000 and relaunched as SearchVB.com. Brent offers tips and tweaks about Apple technology at Mactoids.com.